¡Acompañenos! Tendremos un convivio en el corazón de Roseland. Venga a divertirse, comer, y platicar. ¡Mochilas Gratis! Repartiremos mochilas con útiles escolares ¡GRATIS! a los primeros 150 estudiantes registrados . 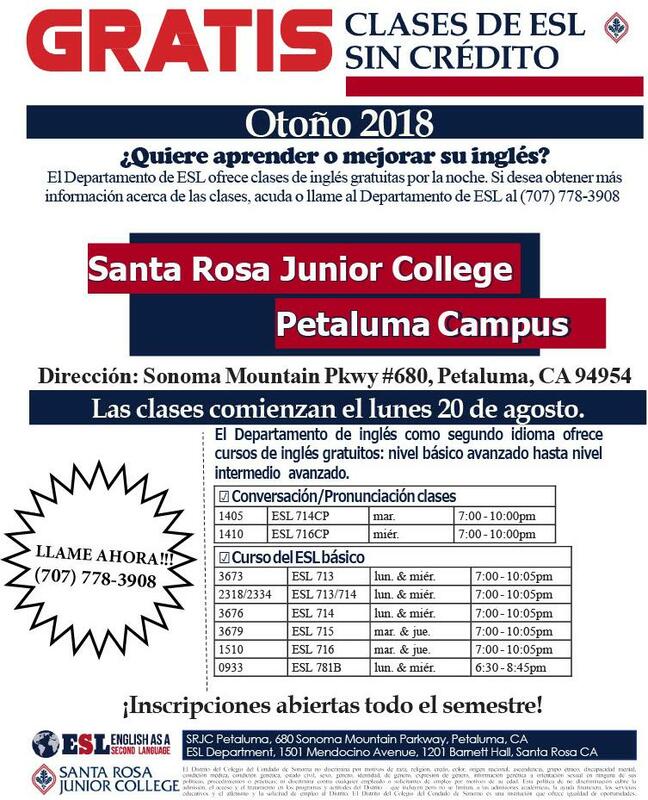 LLAME a Noemi Palomino al 707-297-0033 para registrar a su estudiante. 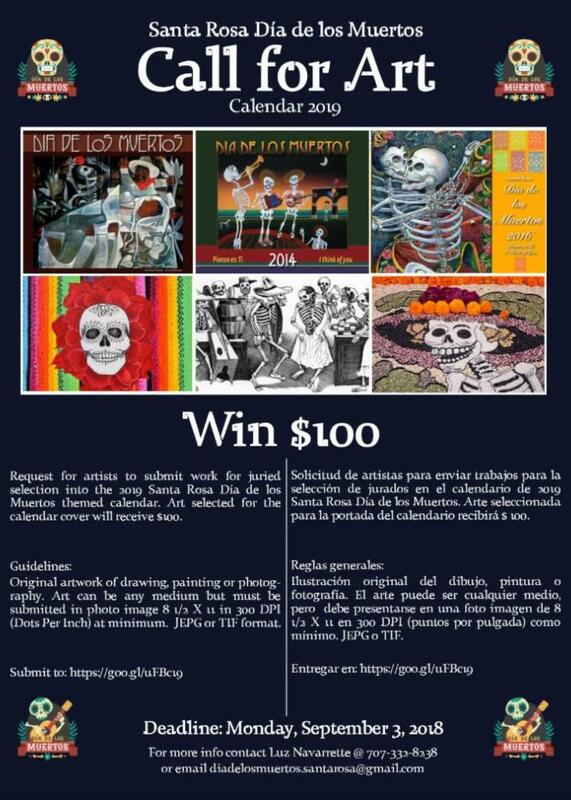 Colaboradores comunitarios: SoCo Backpack Project, Dra. 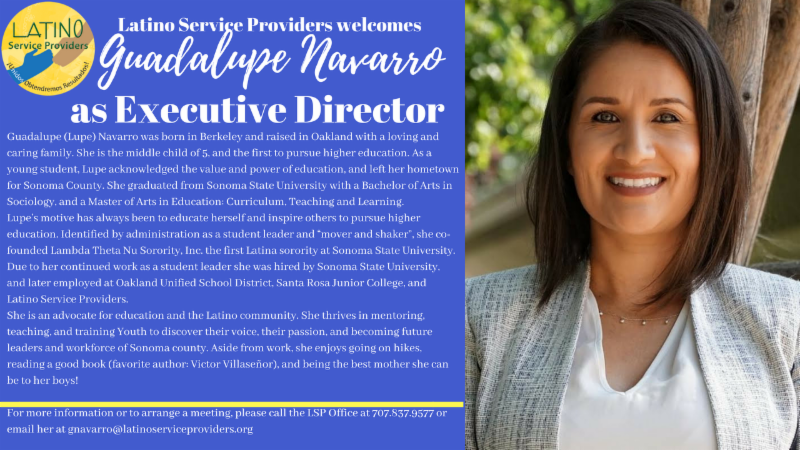 Mariana Martinez, US Army -- North Bay, Community Action Partnership of Sonoma County, Los Cien of Sonoma County, Latino Service Providers, Violence Prevention Partnership, PDI Surgery Center, and Herman G. Hernandez. Join us! There will be a community gathering in the heart of Roseland. Come enjoy yourself, eat and talk to your neighbors. ¡FREE! 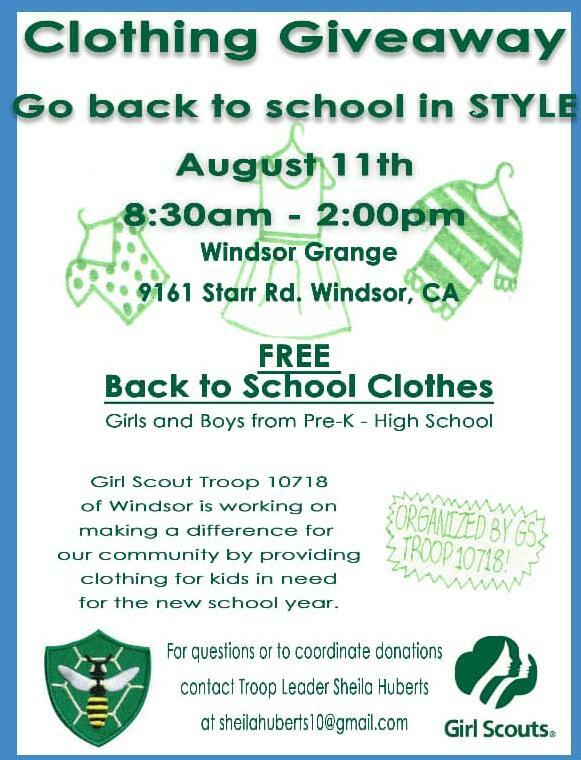 Backpacks will be given out with school supplies to the first 150 students to sign up . 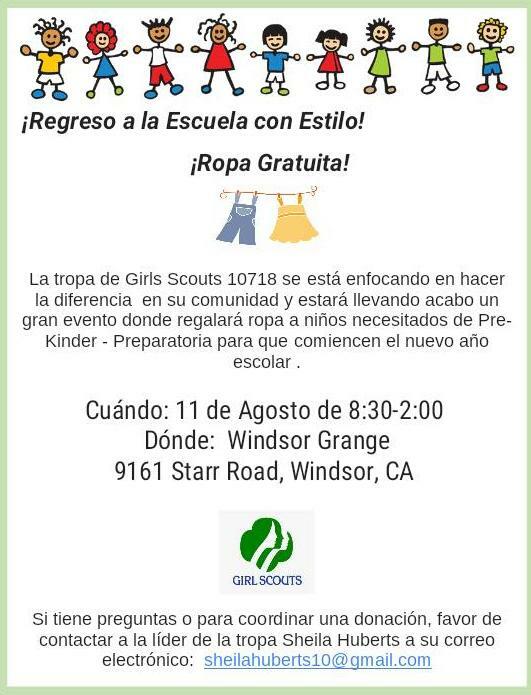 To receive a free backpack you must CALL Nohemi Palomino. Her number is 707-297-0033, please call for more information. We will see you in August! To families, who have children with disabilities - there are still openings for Camp Wamp this summer for all sessions. Camp Wamp is FREE for kids with physical disabilities ages (10-18). Parques Regionales del Condado de Sonoma los/las invita a disfrutar de una mañana placentera y saludable con Nuestros Parques. ¡Estas caminatas en español son diseñadas para toda la familia! 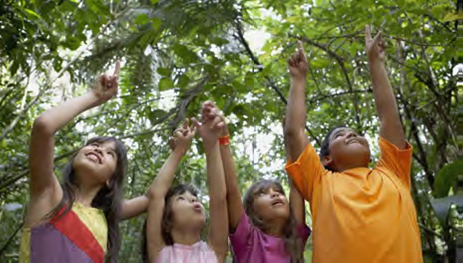 Exploran diferentes temas de naturaleza mientras aprendemos sobre los beneficios de salud que nos da la naturaleza. Nuestros Parques es una caminata de 2-3 millas. Traiga su botella de agua, un platillo para compartir para el potluck, platos y utensilios propios. Nos vemos en la Montaña Taylor por la entrada de Petaluma Hill Road. 4Cs is proud to partner with Transcendence Theatre Company for a special night! 4Cs clients, supporters, friends and family can use the discount code 4CAUG5 and save $7 per ticket. Also, when you use the code $4 per ticket will be donated back to 4Cs! 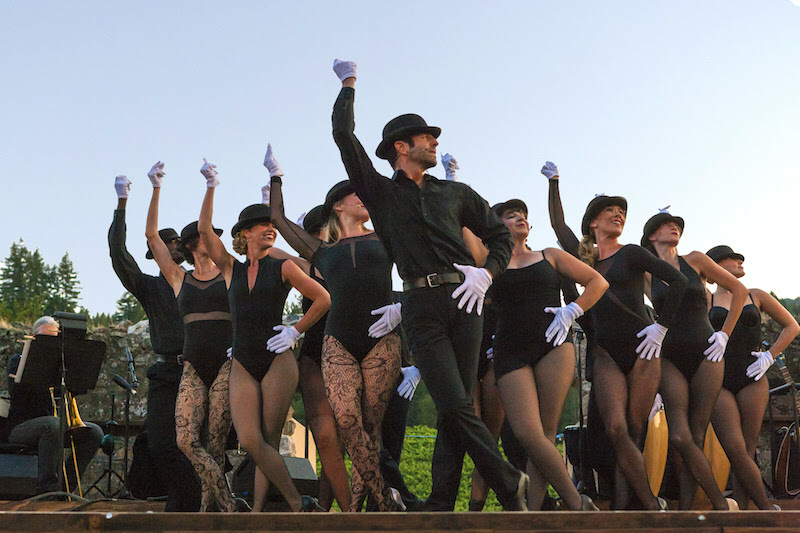 Get ready for the most thrilling dance of the summer with music from Broadway and beyond in an incredible showcase of movement and rhythm paired with show-stopping vocals. Take our hand as we lead you through and evening of spectacular dance featuring beautiful songs orchestrated especially for this show. Lose yourself in the sways and spins that are highlighted with familiar songs from Broadway alongside your favorite popular songs. 4Cs will have a table during the picnicking portion of the event so join us for a night at Broadway under the Stars! Sonoma County Library's "Together at the Table" series, which is a program that encourages our community to come together to voice thoughts and opinions on important topics with decision makers. The program facilitates discussion around current issues. 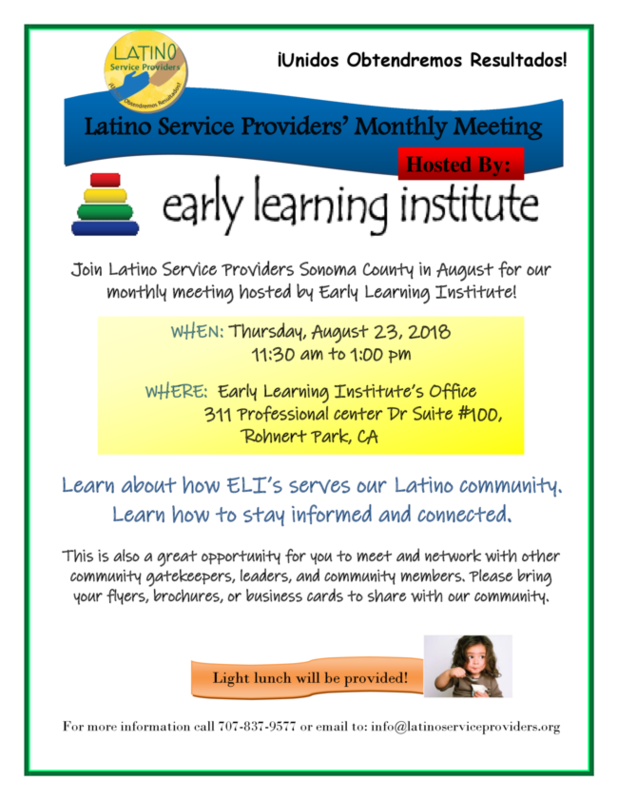 The August topic is INCOME INEQUALITY and panelists include: Sonoma County Economic Development Board, North Bay Jobs for Justice, Sonoma County Workforce Investment Board, and the California Labor Commission. Agricultural Worker Day 8/14 : focusing on agricultural workers needs and resources. Two, two hour tabling events; one in Healdsburg and one in Windsor. 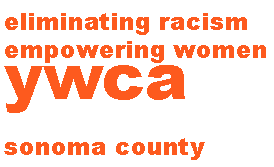 Women’s Wellness with WIC 8/15 and 8/16: Two, two hour tabling events focusing on women’s wellness and child healthcare (one in Healdsburg and one in Windsor). Teen Resource Fair 8/16: One two hour event at Alliance Teen Health Center for teens to come and learn about different community resources. Mental health professionals are reporting epidemic levels of stress in adolescents, with increasing rates of clinical depression, anxiety and other coping problems, creating an unprecedented need for adolescent mental health services. According to NAMI , at least 1 in 5 school-aged children is affected by a mental health condition. 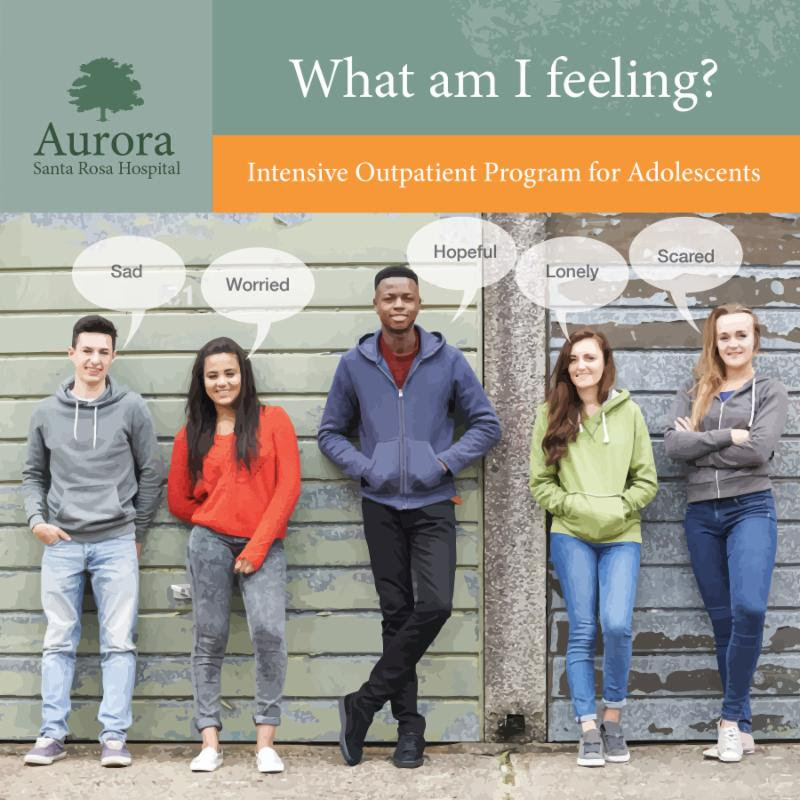 Aurora Santa Rosa Hospital has created an Adolescent Intensive Outpatient Program (IOP) to support the needs of our community. Our Adolescent IOP meets three times a week. 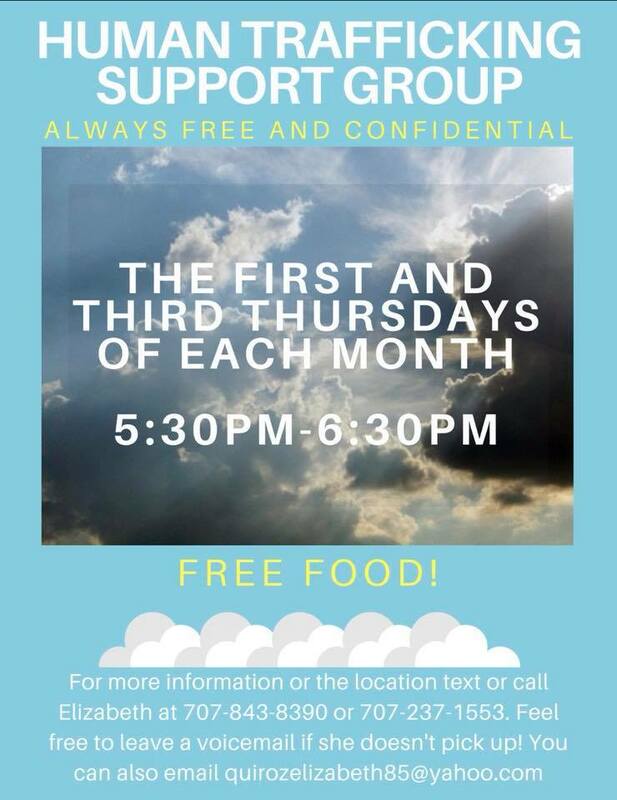 Group times are 4 p.m. to 7 p.m. (summer hours are 3 p.m. to 6 p.m.) on Monday, Tuesday, and Thursday, for a minimum of 9 hours of group therapy per week. Individual and family therapy are an integral part of the program and provide support and education for the family. Our therapists address such issues as coping with stress, anxiety, depression, trauma/abuse, substance use, family challenges, bullying, sexual orientation, suicidality and more. Our treatment approach includes Acceptance and Commitment Therapy (ACT) and Dialectical Behavior Therapy (DBT). Mindfulness, yoga and Movement Creative Expression groups are in the daily curriculum, as well. Our psychiatrist provides medication management for all program participants. 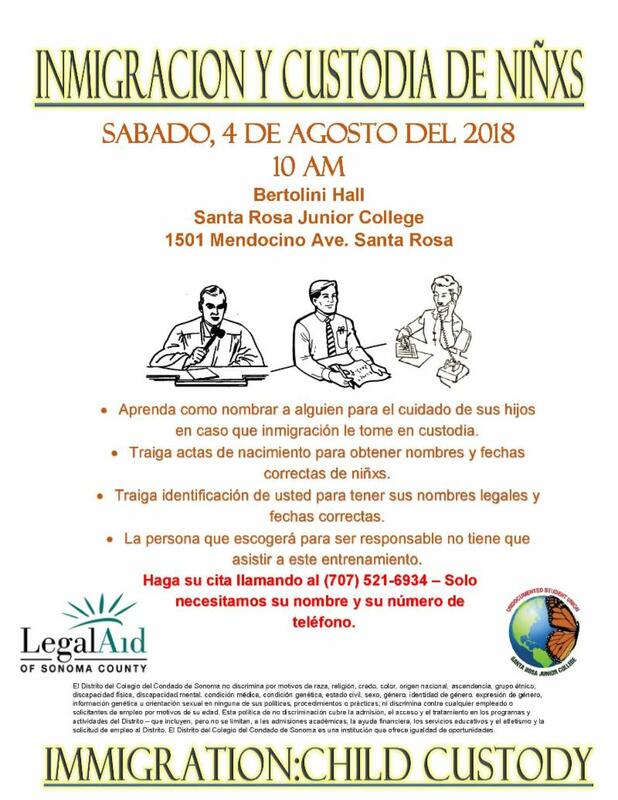 For Program or Agency Providers: You are cordially invited to be a part of the Community Resource Fair to be held during the SRJC Southwest Santa Rosa Center (SWC) Welcome Day event on Saturday, September 15, 2018 from 9:30 am to 1:00 pm . The student population at the SWC includes parents and adults English language learners, and most are educationally disadvantaged. Our hope is to provide an opportunity for our students to feel welcomed, valued, understood and seen. We are optimistic that this special day will encourage student engagement both inside and outside the college. 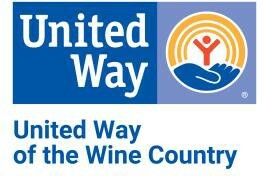 The NGP is a competitive grants program of the United Way of the Wine Country in partnership with Sonoma Clean Power. Together, we are committed to providing financial support to resident- and community-led groups for projects in their neighborhood or community that help its residents rebuild and recover from the October 2017 wildfires and/or build the resiliency necessary to address future disasters. 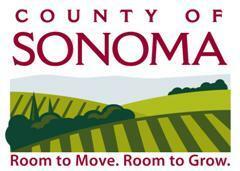 Any resident- or community-led group in Sonoma County is eligible to apply. To apply, the group must include at least five households. 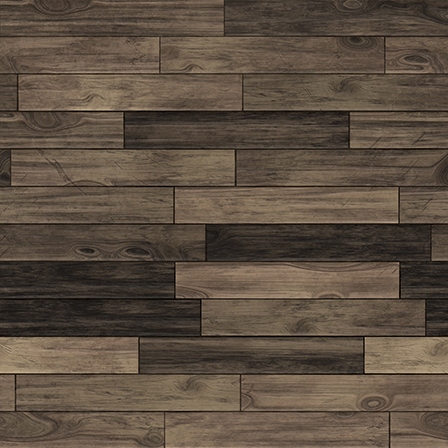 Projects must be carried out in the neighborhood or community where the members live. Priority is given to applications from underserved and/or low-to moderate-income areas of the county. Funded groups will be required to open a bank account under the group’s name. The Wildfire Recovery Neighborhood Grants Program expects to award approximately 5-10 grants. Grants will likely range in size between $500 and $30,000. Funding will be awarded in October 2018. Position Summary: Customer Service Representatives work in a call center environment responding to customer inquiries, maintaining customer accounts, processing service requests, processing tax registration forms, and receiving payments according to specific guidelines and procedures. This class is distinguished from the general office support classes in that the responsibilities include extensive public interaction in situations requiring problem resolution, and duties which relate specifically to the maintenance of accounts. Position Summary: The Executive Assistant in the Human Resources Department provides high level support by skillfully maintaining a working knowledge of priority work efforts, helping to manage scheduling and communications according to the Human Resources Director's priorities, and occasionally provide assistance to the Deputy Directors. Responsibilities include managing incoming calls, responding to requests for meetings, managing complex and often-changing calendars, drafting meeting agendas and routine communications, and performing a variety of administrative tasks. 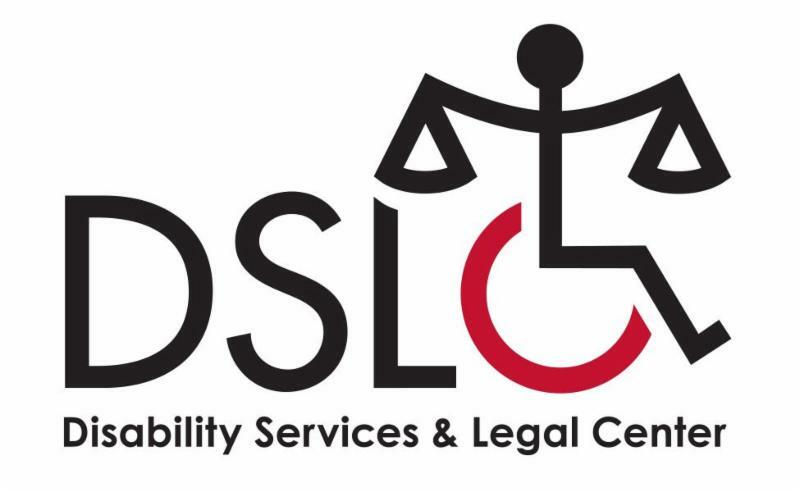 Additional tasks include making travel arrangements, submitting expense forms, creating and maintaining appropriate filing and archiving systems, and generally providing organization and confidential support to the Director. Position Summary: The Case Manager is a two-fold position that involves both indirect coordination of services and direct client service. Under the coordination of services, the Case Manager works collaboratively with service partners, co-located service providers, El Verano Elementary administration, faculty, and staff, and EV FRC/La Luz staff as the point of contact for services, by ensuring schedule of services is up to date, maintaining accurate database entries, and communicating with the Site Manager to create monthly service reports; under the direct client service, the case manager is responsible for providing health and wellness related client services, including assessing families’ needs, connecting families to community resources, assisting families to apply for benefit programs and providing ongoing one-on-one coaching and support as needed. 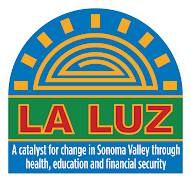 The Case Manager works under the supervision of the EV FRC Site Manager and in partnership with other EV FRC/ La Luz staff, service providers, community service providers, and Sonoma County agencies. Position Summary: The Volunteer Relations Manager is overall responsible for Ceres adult and teen volunteer program which engages nearly 600 adult volunteers and 400 teen volunteers annually in 40,000+ hours of work across two counties. She/he is responsible for ensuring that we maximize the participation of adult and teen volunteers in all areas of our work as part of fulfilling our mission to create opportunities for heart-centered connections throughout the community and enabling us to leverage donations to reach and serve more clients and youth. 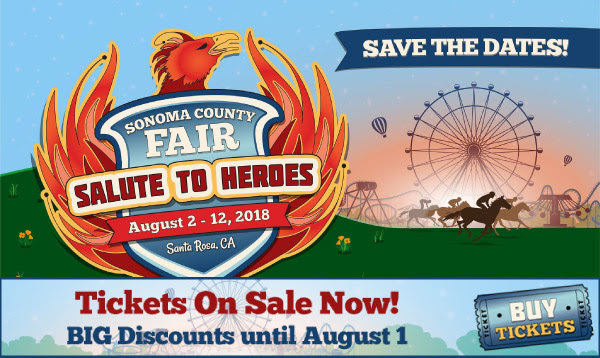 She/he manages Ceres’ relationship with all adult and teen volunteers, and represents the Ceres Volunteer Program in the greater Sonoma County community. The Volunteer Relations Manager acts as a warm, outgoing presence and ensures that all volunteers feel welcomed and at home in the Ceres community. She/he helps uphold the value and priority of the Volunteer Program for staff so that volunteers feel valued and appreciated and are able to contribute in ways that meet their needs. The Volunteer Relations Manager ensures that all volunteers are successfully introduced and oriented to Ceres Community Project, are well trained for each job they are asked to do, and that they feel appreciated and an integral part of Ceres Community Project. 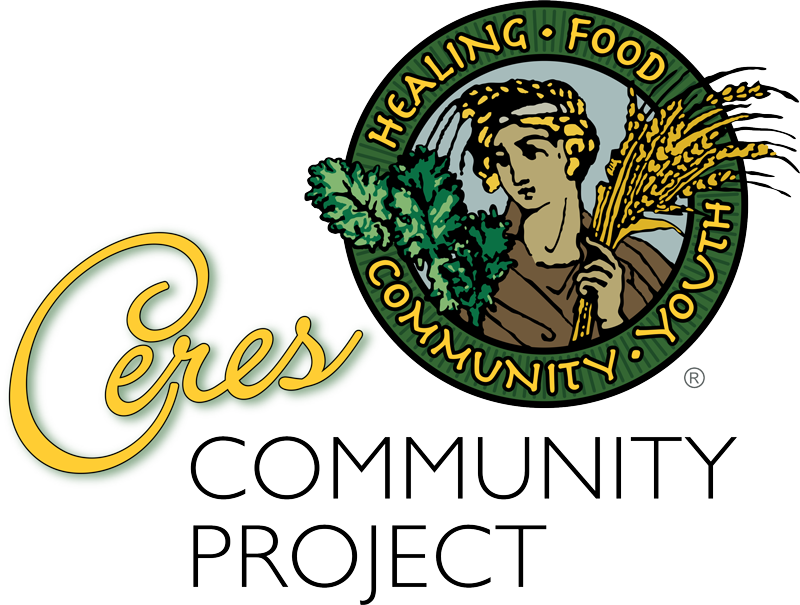 The Volunteer Relations Manager also ensures that volunteers are informed about, and aware of, the deeper intention of Ceres Community Project’s work. ﻿Candidates should send a cover letter with a current resume, your email address and daytime contact info to hr@ceresproject.org. Salary: $18 to $22 per hour. Position Summary: The Community Engagement Coordinator is the overall manager of the agency’s partnership with volunteers of Catholic Charities. This work includes recruitment, training, retention, placement and stewardship of this cohort of people. This position requires innovation and enthusiasm to plan and coordinate a robust engagement program. The Community Engagement Coordinator develops and administers the policies/procedures applicable to volunteers at Catholic Charities and ensures compliance with all requirements. The Community Engagement Coordinator will identify, engage, schedule, cultivate, and maintain relationships to ensure the agencies 2,000+ volunteers have positive and meaningful experiences while volunteering at Catholic Charities. This position is full-time, non-exempt. Position Summary: Under the direction of the Therapy Program Manager and our team of Clinical Supervisors, the Associate MFT/ACSW provides direct clinical services to women, men, children, and families who have either experienced or witnessed domestic violence or who have experienced or are at risk of abuse. This position includes: providing direct psychotherapy treatment, performing client psychosocial assessments, developing treatment plans and guiding the treatment process, developing exit plans, providing psychological and emotional support to clients, facilitating client support groups, adhering to client confidentiality standards, training in trauma informed therapy and participating in individual as well as two hours of group supervision each week. In an attempt to foster greater client empowerment, all direct psychotherapy treatment duties are to be carried out through a client-driven model through which client input heavily shapes treatment plans and goals. This position requires a minimum one year commitment that may be extended at the agreement of both parties.